Blur Busters Forums • View topic - New Easy Free Pursuit Camera: Smartphone. No rail needed. Some of you may be familiar with the Pursuit Camera Instructions and maybe thought it was too much work, or even expensive with a rail! But, in case you didn't know yet.... Display motion blur photography can be done without a rail now, for enduser/amateur purposes. 1. Stationary gaze: The sync track is disjointed/broken. 2. Eye-tracking the UFOs: The sync track aligns into what looks like a horizontal ladder. Many can do much better than this low-quality video (a random "first try" on an old iPad mini); however, this video demonstrates how much more accurate even a bad pursuit camera (end-user motion blur photographing) can be than a static camera. You can observe how WYSIWYG the horizontal ladder is -- and ghosting streaks are. This is just an iPad camera at default settings, not even using the "Pro Camera" app that lets you set camera exposure length. Full camera adjustment (exposure, white balance, etc) is preferred for more scientific results. However, in a pinch, this is great for remote troubleshooting -- aka end-user ghosting-artifact troubleshooting. Certainly, these are not perfect (e.g. 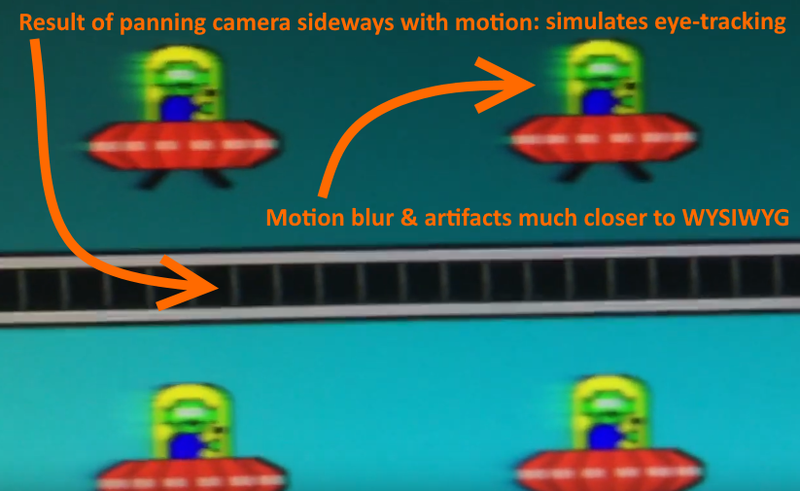 smartphone focus issues, shaky hands, etc), but it is a clear demonstration of how a moving camera lens (tracking motion) is a better equivalent of a moving eyeball (tracking camera). Ideal exposure for a pursuit camera is approximately 1/30sec (or four refresh cycles at 120Hz) -- roughly matching human vision integration times -- but there's some leeway for deviations from this, with increasing error margins. Now you understand pursuit camera! And it's easy to learn. This can kind of be done with other TestUFO patterns such as http://www.testufo.com/eyetracking and http://www.testufo.com/persistence although without a sync track, it's not as easy to aim the speed of the camera. But for troubleshooting simple motion blur behaviours (e.g. helping a user), it can still have enough visual data to be useful. Here's an example of 120fps having roughly half the motion blur of 60fps, and 240fps having roughly half the motion blur of 120fps. Exactly as you saw in person. (Note: GtG limitations start limiting differences, as refresh durations get shorter, so faster GtG will amplify differences between 120fps and 240fps). 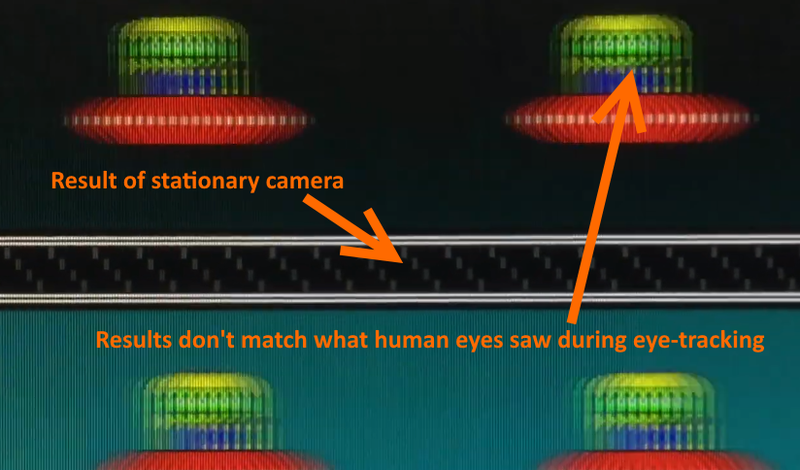 While not as accurate as a rail, it's very clear that that the different framerates have different motion blurs, in an uncannily accurate match to what your human eye saw during eye-tracking. - See My Pursuit Camera Paper (peer reviewed) -- I'm the co-author. Co-authored with NOKIA, NIST.gov and KELTEK, and conference paper is on ResearchGate by yours truly Mark Rejhon (Chief Blur Buster). This test is currently adopted by RTINGS.com, HDTVtest.co.uk, HDTV Poland, TFTCentral.co.uk, and other sites. But even you, can practice pursuit photography to accurately capture a relatively accurate WYSIWYG approximation of human-perceived display motion blur! Most of them use a rail, but some now do it raillessly and single-step through the frame to find the most accurate freezeframe -- free pursuit camera photography using just your smartphone and your hand! Re: New Easy Method of Pursuit Camera: No rail needed. The above 3 photographs (in animated PNG) were captured from a Samsung Galaxy smartphone attached to a smartphone holder on top of a manual sliding camera rail. The colors are a bit oversaturated as is typical of many smartphones, but the tracking accuracy and astounding detail captured of the human-perceived ghosting/corona artifact is par excellencé. That's how the professionals do it. However, you can do it too -- with any smartphone -- and you can do it raillessly with just a hand-waved smartphone! -- and still get useful results! (e.g. comparisions between monitor settings, different displays you own, different refresh rates, etc). 1. Instead of moving your arm, you can keep your arm fixed and pivot your computer chair (with your outstretched arm) instead while pursuiting. Your body doesn't move, only your chair spin. That creates much more stable pursuit camera. It may be a slight arc but the center part of your spin will be parallel to the screen and potentially produce nearly rail-quality pursuits once in a while. 2. Don't begin slowing down your hand pursuit until your hand's already overshot the monitor's right edge. 3. Don't forget to repeat a few times in the same video clip, so don't stop recording video, just move your smartphone back to the beginning at left, keep repeating maybe three, four, five or more times. Until you think you've gotten some good hand pursuits. 1. Some smartphones will fight against you with auto-exposure, auto-focus, and auto-whitebalance. 2. If you're using an iOS device, start video recording and first point at a stationary semi-dark area (not too bright and not too dark, not in motion) (e.g. like focussing your camera on the statusbar below the animation) at the distance you need and hold finger down to lock your focus and camera exposure. That will automatically fix the focus/exposure on iOS devices. Now execute your pursuits without touching anything else on your screen. 3. If exposure seems too short (only one or two tickmarks per "ladder rung" in the ladder sync track) or things look too dark, dim your monitor's brightness to force exposure to go longer. If it still doesn't work properly, download a 3rd party camera app such as Pro Cam and manually fix the focus / fix the exposure / fix your ISO / etc -- then the smartphone camera will work with you rather than against you. Remember, hand-waved pursuit camera is more unscientific than precision propelled camera rails, but it can produce a very excellent approximation of WYSIWYG display motion blur effects during eye-tracking situations! And capture subtle display ghosting behaviours much better than a non-moving camera.